The political victories of anti-neoliberal movements and regimes have opened a new chapter in Latin American history, yet the embrace of extractive industries has generated deep paradoxes for those committed to addressing inequality and the crisis of nature. Leaders and movements speak of revolutions—Venezuela’s “Bolivarian” revolution, Bolivia’s “democratic and cultural” revolution, and Ecuador’s “citizens’ revolution”—and governments have indeed taken steps to address inequality in housing, education, health, employment, and social welfare. Yet, like their conservative neighbors, left-leaning governments are entangled in Latin America’s renewed dependence on natural-resource extraction. As explored by Anthony Bebbington in the NACLA Report of September 2009, this new “progressive” extractivism is much like old extractivism—destroying the environment, generating intense social conflict, and eroding indigenous and citizen rights. Despite the use of resource rents for certain redistributive policies, it is not as yet clear whether these governments can pursue “revolution”—the deepening of social, political and economic democratization—while they are still resource pools for capitalism’s destructive global assault on nature and the climate. How then to conceptualize the political challenges for social movements conjoining economic and social exclusions and climate change activism when we dialogue across North-South histories and politics? A large part of this revolves both around the very different meanings of things like “gas” and “oil.” In the North (where it is easy to oppose SUVs, coal power, tar-sands pipelines, and big oil) and the South, or Bolivia at least, where words like “natural gas” are as likely to provoke progressive fervor for basic improvements in daily life as they are environmentalist disgust. Yet the struggle also revolves around considering how social movements formulate political visions and make articulations and alliances. If in the North, the crucial linkages involve labor, people of color, and the historically “white” and privileged environmentalist movement (increasingly reshaped by anarchist urges), in places like Bolivia the crucial linkages to forge are largely between those on the urban margins, particularly youth, and the rural peoples and communities affected by extractivism. Finally, how are movements able to generate knowledge and an understanding about the articulation between the workings of power and politics and the fossil-fuel industry? 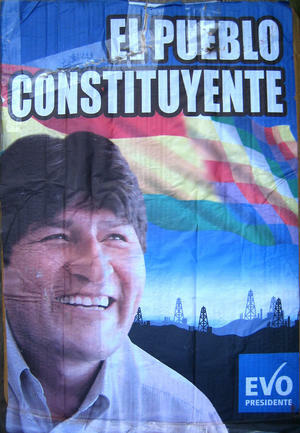 For progressive and left-leaning intellectuals both within and outside of Bolivia, the tenor of debate tends toward critical support of the ideas behind the “process of change” with intense indignation about authoritarianism, hubris, corruption, old-style corporatist politics, and the assault on indigenous and citizen rights. Former constitutional assembly member Raúl Prada has critiqued the authoritarian paranoia of the government, but calls, like many, for a defense of the “process of change”—the ideas on which the new regime was founded: the plurinational state, indigenous territorialities, the rights of Mother Earth, and other pluralities of historical struggle and practice—feminist, communitarian, and otherwise.3 Others are blunt and less forgiving. Philosopher Luis Tapia has called the MAS the “most anti-indigenous government in recent years.” Ecuadorian economist Pablo Dávalos argues that Morales and Correa, rather than saviors of the Mother Earth or revolutionaries for the 21st century, are servants of global capitalism and “accumulation through dispossession.”4 Silvia Rivera Cusicanqui writes that the MAS is virtually a replica of the neocolonialist development project of the past, allied with a military virtually unchanged from its own past of illicit activities and an anti-democratic Cold War mentality, and running a government amid a growing climate of impunity. Old-style politics of divisionismo (dividing social movements) and the service of “foreign interests” over citizenship, democracy, and sovereignty constitute, for Rivera, a “revolutionary parody” varnished with cheap indigenous and ecological rhetoric.5 These critiques draw our attention to has the stakes are as much about the defense of democratic political spaces to rethink nature, economy, and society as they are about taking a strong “anti-extractivist” stance. Those familiar with recent events may react, as many Bolivians have, with indignation at this justification, given that the “revolution” is also using “tools” that are deeply anti-democratic. García Linera downplays the rising role of Brazilian interests and the government’s own relationship with multinational gas firms. There is nothing said about the racist diatribes by highland (indigenous) MAS party militants against lowland indigenous peoples, the ongoing disregard for the relatively progressive content of the Bolivian constitution, or police violence against unarmed women, men, and children. Are we thus asked to make a political calculus between “social” progress and “extractive” destruction and conclude that there is no alternative? García Linera is in many ways correct in his analysis of extractivism and in the need for a defensive posture in the face of ongoing destabilizing efforts. And indeed, it was the mandate of the pueblo who waged Bolivia’s “Guerra del Gas” in 2003 to nationalize (and commercialize) Bolivian gas, by and for the people of Bolivia. In a country marked by deep poverty in which gas has been construed as a means of national salvation, there is little popular opposition to the extraction of natural gas. Gas in Bolivia is not primarily understood through the lens of climate change—though climate change and its effects and causes are clearly part of Bolivian political consciousness—but as a medium for negotiating rights, well-being, and exchange between citizens and the state. It is here that movements must juggle the powerful discourse of rights to consumption—and the allure of rent seeking—against the possibility of thinking beyond extractivism for other types of politics and futures. The challenge is great given the seductive power of spectacle for shaping everyday common sense. Day-to-day events like the opening of a filling station or the installation of gas lines into urban homes are put on display as signs of revolutionary progress. In mid-February 2013 (as occurs two or three times a month), Morales helped to inaugurate 1,600 new gas-line installations into households of a marginal urban neighborhood, this time in the Andean city of Oruro. The gas comes by pipeline to the Andes from the dry Chaco. It is a portion of the relatively small domestic share (about 15%) of Bolivia’s overall gas production; the rest goes to Brazil (57%) and Argentina (28%).8 As with urban fossil fuel consumers everywhere, the impacts of gas development in the far-off Chaco are largely invisible here. Indeed, if anything, the association between gas and the Chaco is often made through invocations of the war with Paraguay (1933–35) and the struggle against foreign exploitation. Installing and turning on household gas to fire a stove in your kitchen becomes a moment of patriotic and historical resistance. In this marginal neighborhood of Oruro, clearly a bastion of support for Evo, the president posed for a picture beside a gas meter recently installed in the exterior wall of a humble abode.9 He turned on the gas while wearing an oil worker’s helmet, confetti, and a wreath of flowers—ubiquitous symbols of public ritual. He lauded nationalization for allowing the government to “attend to the demands of the people” and reduce their gas costs to $2 per month. “Thanks to Mother Earth,” he said, Bolivia has “cheap gas.” Since much of Bolivia still carries out a daily search for firewood, and housewives (mostly) stand in long lines to exchange propane (LPG) tanks to get their cooking done, such a convenience is indeed a sign of change. Between García Linera’s defensive justifications and Evo’s practical engagements with the pueblo, extractivism is thus rebranded as social and political transformation. Mother Earth herself is repositioned as a mercantilist benefactor rather than powerful spiritual force. One would be hard pressed to find outright opposition to gas extraction in Bolivia, although perhaps the coming storm of fracking will generate more critical debate. Especially for the urban poor and aspiring urban middle classes, support for the MAS—or for Correa in Ecuador—is thus not, and should not be, surprising. On the other hand, it is also among urbanites—young people in particular—that there may be space for political articulations with rural and indigenous peoples who bear the brunt of the “new extractivism.” As Rivera Cusicanqui points out, urban youth were at the fore of solidarity with the indigenous organizations of TIPNIS. And indeed, the positioning of urban youth—as something more than consumers of gas—is crucial in resource-dependent contexts like Bolivia. As Michael Watts and others have shown for rentier hydrocarbon societies like Nigeria, young people alienated by resource-rich, aspiration-high, and job-scarce contexts are as apt to join regionalist or reactionary political movements as they are to embrace progressive politics. Indeed, we see precisely the former—conservative regionalism—dominating much talk of young people. Here the politics of extraction, and of climate change more broadly, might be considered on two scales. First, what is at stake is defense and expansion of the dwindling space for autonomous processes of political and social mobilization and alliance building that emerge from variously positioned social movements. This is the plurality of grounded experience that Raúl Prada invokes—of poverty, inequality, and exclusion—that exploded to the surface with the rise of the MAS, but which has been gradually silenced with the narrowing of power. This certainly involves a revolutionary commitment to address the dislocations of the extractive economy—the landless and jobless poor, indigenous peoples’ self-determination rights, the toxic damages of extraction, the joblessness and frustrations of urban youth, the dislocations caused by oil and gas operations, and the intensification of violence against women—that invariably accompany hydrocarbon economies. As signaled by Rivera Cusicanqui, urban youth may certainly embrace the possibilities of improvements in daily life but are able to ideologically penetrate what Fernando Coronil referred to as the “spectacular” quality of state making in oil- or gas-rich contexts. Against the disturbing trend now emerging—buying of leaders, division of movements, accusations of subversion, criminalization of protest, and the reduction of political thought to the common coin of rent circulation—there may be potential for articulations between urban young people and those areas most directly affected by extractivism. This requires not simply an environmentalist urge but an embrace of anti-patriarchal, anti-racist, and decolonizing thought—all barriers to effective articulation across Bolivia’s varied spaces of struggle. The second scale is that of the production and public dissemination of knowledge about the extractivist political economy—not simply in opposition but as a means of critiquing and shaping political directions. Whereas the defense of social-movement space calls for openness to plurality and the fertilization of new political visions for connecting movements, the rethinking of the national agenda calls for the formulation of alternative visions of the future against the narrowing space of government energy policy and planning. Who should decide if the government should industrialize gas by making plastics and fertilizer plants? Or should the government invest in small-scale agrarian cooperatives or manufacturing? Should Brazil and Argentina be given priority? What should be the priority for natural resource use and industrialization? And so on. Here we see in Bolivia think tanks and pundits from the right still critiquing nationalization, yet this “knowledge” merely argues for more extraction and more privileges to foreign capital. Other critical spaces, like the research organization, CEDLA, offer more progressive critiques and ways of thinking about the dilemma of dependence and the prospects for post-extractive economy. In a recent conference, experts at CEDLA argued that the decision-making process about natural gas exploitation is still largely determined by the foreign (private and semi-public) hydrocarbon companies, the three largest being Repsol (Spain), Total (France), and Petrobras (Brazil). So, while Vice President García Linera suggests that the revolution is working to loosen the grip of foreign capital, the government is still largely under its sway.10 CEDLA economist Carlos Arze argued that foreign companies still control more reserves and production than the state and that government fiscal dependence on hydrocarbon rents is deepening, even as the government talks of economic diversification. Exports of other goods, manufactured and not—even to the allied nations of the ALBA—are shrinking. Out in the Chaco, where gas-drilling rigs and seismic operations spread across the dry hills, recent years have seen recurring drought. Cattle lie dead and dying, hides taut and dry, jagged hip bones thrust toward the sky. Flies pursue moisture where there is little to be had—in puddles, cow dung, and sandy creek beds. Large ranchers cushioned by years of accumulated wealth can manage, yet small farmers like the Guaraní confront their blistered and withering crops with despair and desperation. They go to work in cities, towns, and farms, pursuing day labor to get the family through. Some have taken up on the peripheries of gas operations as unskilled labor to earn money. Aspirations for land reform and territory were intensified with the rise of the MAS, but large landowners still control the green valley lands. Meanwhile, the gas boom that has spread across the Chaco and generated a huge fiscal surplus in the national treasury has done little to ameliorate the poverty and inequality of the Chaco. Gathering firewood is still a daily task, even as gas is siphoned out from beneath the earth. There are plenty of conflicts over rents—between regional government elites, between unemployed workers and gas service firms, between indigenous leaders, and company and state representatives. Yet long-standing political visions are frequently compressed in time and space to battles over percentages—a job, a compensation, a piece of the pie. Many Guarani avidly supported the MAS, and indeed, during the early years the MAS allied with the Guaraní to make inroads into local power. Still today, initiatives like multilingual education link indigenous peoples and the state. Yet the economic revolution—and more mundane changes like improved access to effective rights to land, credit, technological assistance, health care, better medical technology, and well-trained doctors—have yet to appear. The ideology of “living well,” or vivir bien, is oft-mentioned, but what is on the horizon are drilling derricks. Gas—Mother Nature, of sorts—does have many rights, including the right to water, and trucks rumble in bringing this water consumed in drilling operations and left as pollutants in holding ponds. Where, then, is the revolution for the Guaraní? Future transformations will come through the retaking of the process of change by those who created the possibilities for its existence: Bolivia’s social movements and their ongoing pursuit of new relations between state, nature, and society. 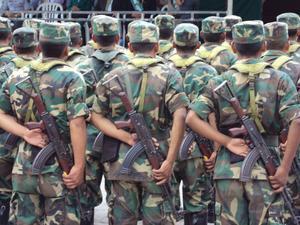 The TIPNIS conflict revealed the capacity of movements to mobilize public debate and sentiment. To the extent that these conflicts make visible and articulate linkages between extractivism and socio-environmental dislocations, they serve to deepen the process of change. The great risk is the absorption of the movements by rentismo. As Eduardo Gudynas suggests in his essay, Bolivia continues to be a place of political vitality and originality, reflected both in its intellectual tradition and in its grassroots movements. With a return to support for plurality and the movements, embedded within solidarity for the process of change, there is a permanent effervescence of political visions and aspirations for justice. There is a modest chance, whether in the halls of the power or in the hot and spirit-filled outlands of the Chaco, for the deepening of revolution. 1. Consejo Nacional Electoral, Ecuador, resultados.cne.gob.ec. See also Pablo Ospina Peralta, “‘First Reflections on a Defeat’ for Correa’s Leftist Opposition,” Upside Down World, February 21, 2013, available at upsidedownworld.org. 2. See Emily Achtenberg, “Battle of Reports Sustains Bolivia’s TIPNIS Conflict,” January 18, 2013, Rebel Currents blog, nacla.org. 3. Raúl Prada Alcoreza, “Defensa crítica del proceso,” Rebelion, January 16, 2013, available at rebelion.org. 4. Pablo Dávalos, comment on Ana Esther Ceceña, “Debates que tejen emancipaciones,” Rebelion, May 26, 2012, available at rebelion.org. 5. Silvia Rivera Cusicanqui, “Del MNR a Evo Morales: disyunciones del estado colonial,” ­Bolpress, January 31, 2012, available at ­bolpress.com. 6. Álvaro García Linera, Geopolítica de la Amazonía: poder hacendal-patrimonial y acumulación capitalista (La Paz: Vicepresidencia del Estado, 2012). 7. For a critique of similar positions taken by Correa, see Eduardo Gudynas, “Hoy, en América Latina, Marx ¿sería extractivista?” ALAI, February 7, 2013, alainet.org/active/61470, and Joan Martinez Alier, “Marx y el extractivismo del presidente Correa,” Bolpress, February 25, 2013, available at bolpress.com. 8. On average, as of December 2012. “El informe semanal del 17 al 23 Diciembre 2012,” Hidrocarburos Bolivia, available at hidrocarburosbolivia­.com. 9. “Morales Entrega 1,600 Instalaciones de Gas Domiciliario en el Distrito 3 de Oruro,” Agencia Boliviana de Información, Feburary 7, 2013, available at www3.abi.bo. 10. See Carlos Arze Vargas, “Política energética y empresas estatales: una evaluación,” CEDLA, September 27, 2012, plataformaenergetica­.org/content/3696. See also Brent Kaup, “Trans­national Class Formation and Spatialities of Power: The Case of Elite Competition in Bolivia,” Global Networks 12 (2012): 1–19. 11. Raúl Prada, “El nuevo etnocidio: el proyecto de ley de consulta anti-indígena,” Horizontes ­Nómadas, February 5, 2013, available at ­horizontes​nomadas.blogspot.com. Bret Gustafson teaches Social Anthropology at Washington University in St. Louis. He is the author of New Languages of the State (Duke University Press, 2009) and co-editor, with Nicole Fabricant, of Remapping Bolivia: Resources, Territory and Indigeneity in a Plurinational State (School for Advanced Research Press, 2011). Read the rest of NACLA's Spring 2013 issue: "The Climate Debt: Who Profits, Who Pays?"